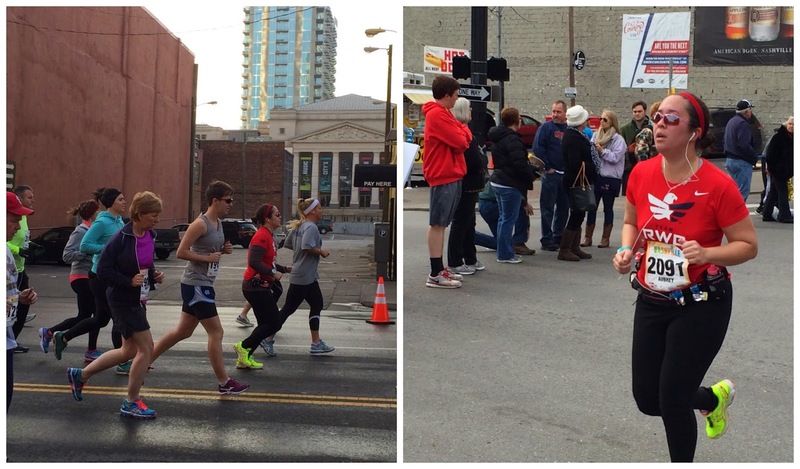 On November 8th, I completed the Nashville Half Marathon, benefitting the Leukemia & Lymphoma Society. I'd been off my training game for two weeks due to bad congestion in my chest (and a horrid cough) but I still went through with it! There were about 1000 less runners than the previous half marathon I ran, but there were still plenty of people around me to be able to push myself. 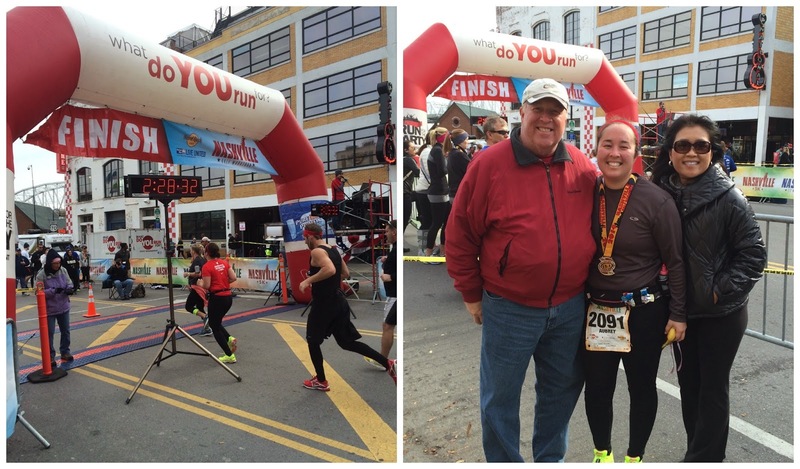 I also had both Mom and Dad there to cheer me on! They helped me ditch my long sleeves AND provided some iced green tea around Mile 5/6 to give me an energy push. Overall, I felt pretty good. I did a run/walk like last time, but I missed a bunch of my walking minutes just getting into the groove running. Not too bad! This was also my first long distance in newer shoes (check out that neon!) but using the same inserts. No blisters, no real hot spots either. I wore compression tall socks again too. My Mile 11, I knew I was on track to a PR, except I thought it would be over sooner than it was... there were KILLER HILLS in the last 1.5 miles, so I definitely was sucking over that last bit. I ended up beating my previous time by 3 minutes, which I can't complain about, especially having been sick. 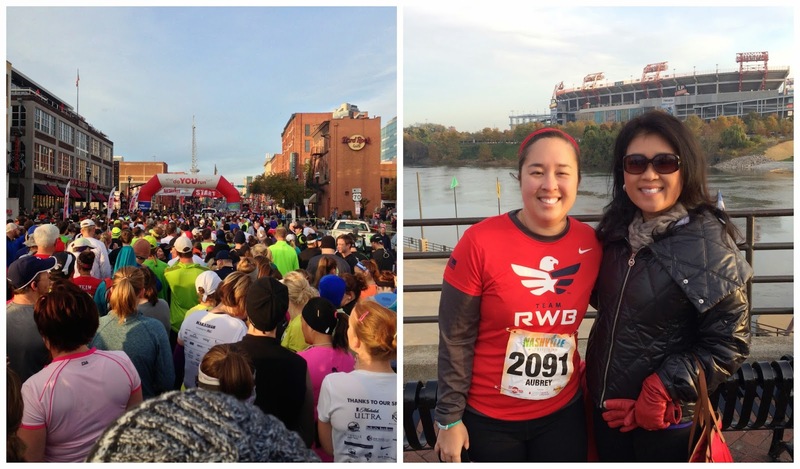 We covered some similar ground as the other course (Music Row, the Gulch) but also crossed over around LP Field and all the way to Shelby Bottoms park. My real (chip) time was a minute faster than the clock! I preferred the Women's Running Half Marathon given all of the fellow women participating, more frequent water stops, and a little more everything in general... big expo, lots of activities, blingier medal. But this was another good checkpoint for my marathon training, and I felt better than I have after previous long runs. Overall, I experienced some stiffness in the days following, but by Tuesday I felt great.